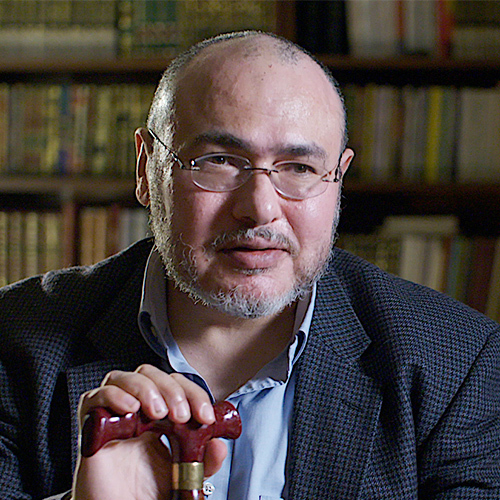 Dr. Khaled Abou El Fadl is one of the world’s leading authorities on Islamic law and Islam, and a prominent scholar in the field of human rights. He is the Omar and Azmeralda Alfi Distinguished Professor in Islamic Law at the UCLA School of Law where he teaches International Human Rights, Islamic Jurisprudence, National Security Law, Law and Terrorism, Islam and Human Rights, Political Asylum and Political Crimes and Legal Systems. He is also the Chair of the Islamic Studies Interdepartmental Program at UCLA. Among his many honors and distinctions, Dr. Abou El Fadl was awarded the University of Oslo Human Rights Award, the Leo and Lisl Eitinger Prize in 2007, and named a Carnegie Scholar in Islamic Law in 2005. He was previously appointed by President George W. Bush to serve on the U.S. Commission for International Religious Freedom, and also served as a member of the board of directors of Human Rights Watch. He continues to serve on the advisory board of Middle East Watch (part of Human Rights Watch) and regularly works with human rights organizations such as Amnesty International and the Lawyers’ Committee for Human Rights (Human Rights First) as an expert in a wide variety of cases involving human rights, terrorism, political asylum, and international and commercial law. In 2005, he was also listed as one of LawDragon’s Top 500 Lawyers in the Nation. A prolific scholar and prominent public intellectual, Dr. Abou El Fadl is the author of 14 books (five forthcoming) and over 50 articles on various topics in Islam and Islamic law. He has lectured on and taught Islamic law throughout the United States and Europe in academic and non-academic environments for over twenty years. His work has been translated into numerous languages including Arabic, Persian, French, Norwegian, Dutch, Ethiopian, Russian, and Japanese, among others. Dr. Abou El Fadl is most noted for his scholarly approach to Islam from a moral point of view. He writes extensively on universal themes of humanity, morality, human rights, justice, and mercy, and is well known for his writings on beauty as a core moral value of Islam. He is one of the foremost critics of puritan and Wahhabi Islam. Dr. Abou El Fadl has appeared on national and international television and radio, and has published widely in such publications as the New York Times, Washington Post, Wall Street Journal, Los Angeles Times, Boston Review and many others. Professor Abou El Fadl is the founding advisory board member of the UCLA Journal of Islamic and Near Eastern Law (JINEL), and an editorial board member for Political Theology, the Journal of Religious Ethics, the Journal of Islamic Law and Society, the Journal of Islamic Law and Culture, and Hawa: Journal of Women of Middle East and the Islamic World, among others. He also serves as an advisory board member for the University of Adelaide Research Unit for the Study of Society, Law and Religion (RUSSLR) in Australia; the Carnegie Corporation of New York’s Islam Initiative Publications Project; the Harvard Press Series on Islamic Law; and the Journal of Islamic Studies (Islamabad), among others. His most recent works focus on authority, human rights, democracy and beauty in Islam and Islamic law. His book, The Great Theft, was the first work to delineate the key differences between moderate and extremist Muslims, and was named one of the Top 100 Books of the Year by Canada’s Globe and Mail (Canada’s leading national newspaper). His book, The Search for Beauty in Islam: A Conference of the Books, is a landmark work in modern Muslim literature.